Great audience response and crowd pleaser. Well worth the money. I would like more instruction on amazing presentation ideas for taking away the ability of a volunteer to read. Regarding another presentation, the instructions regarding 4 audience members holding up a different card and another audience member guessing who has what card needs much better instruction in terms of clarity. While this item is a bit pricey, it is well worth the investment for the performing mentalist. While not a "new" idea, it is a perfect application of a little known principal. I would have liked them to include the original Photoshop files to allow user to create their own word cards. That being said, with a little graphics arts talent, you can make your own once you understand how this works. Secondly, I wish the written instructions had gone into even more depth on some ideas. I did appreciate the added .pdf information. Lastly, I really disliked the production quality of the video instructions. The ideas were relayed, but the author wanted to be "arty" (claims to be a filmmaker), and he got lost between Art and Artifice. Truthfully, I did that type of thing in my 1st year of film school. Setting was pretty bad and bird talking during filming is just a film 101 mistake. 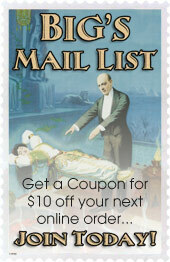 Click the button below to add the 100th Monkey (2 DVD Set with Gimmicks) by Chris Philpott - Trick to your wish list.